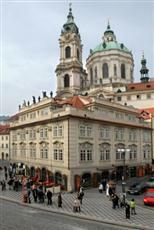 Amour Hotel Residences is located in the middle of the Lesser Town Square in an immediate vicinity of the Prague Castle. Amour Hotel Residences welcomes visitors with romantic suites on the top floor of a Rococo palace built in 1786 and also known as Gromling Palace. All apartments are elegantly appointed with stylish furniture, oak floor and include kitchenette. Their windows allow a unique view of the Saint Nicholas Cathedral and other historical buildings in the surroundings. A guarded car park and a tram stop are in front of the palace. Residence provides 24 hours reception service. Amenities: airport transfer, safe deposit box, non-smoking rooms and pets are allowed.